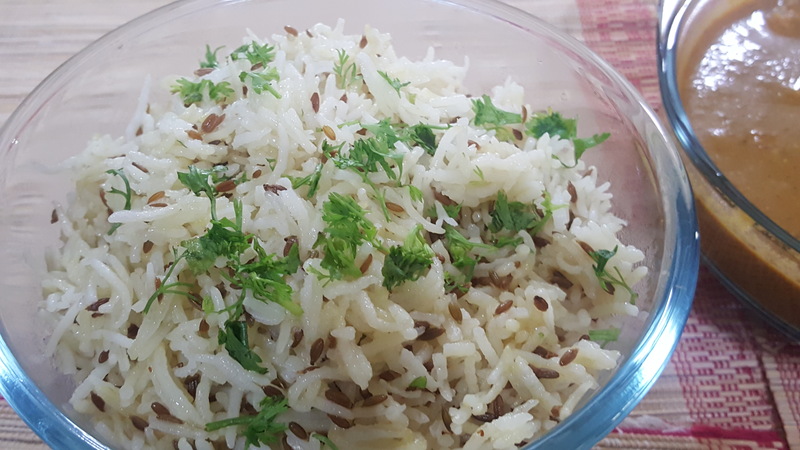 Jeera Rice is a a simple flavourful rice preparation, which can be served with dal, any vegetable curry, chicken or mutton curry or just plain curds and pickle. Morever, in the microwave, it gets cooked in a jiffy. Here’s the recipe of jeera rice in a microwave. Wash rice and soak in water for around 15 minutes. Take a microwave safe bowl. Put ghee in it and add jeera. Cook uncovered, on high for 30 seconds. Add rice, salt and 2 cups of water and mix it well. Microwave uncovered, on high for 15 minutes. Cook covered for another 5 minutes. Let it stand for 5 minutes. Jeera rice is ready to serve.